Most of you know how much I love cupcakes. I won the Crazy for Cupcakes set at convention but I knew as soon as I saw this stamp that I had to have it. I mean who wouldn't want a cupcake this size?? 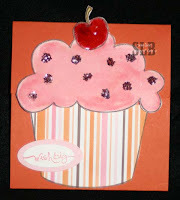 This set is called Simple Birthday Thanks but I personally think it should be called Life Sized Cupcake! It's a set with some thank you lines in the middle so a young child can write easy thank you notes. I simply cut out the center because I wanted it blank. It's hard to tell but this is a flap card. The icing lifts up to reveal the inside of the card. I had so much fun making this card! Of course with a cupcake this size, it needed the appropriate greeting and what could be better than "Wish Big"! All products are from Stampin' Up! Thanks Natalie! I really enjoyed "reporting" from convention. I guess all those years of journalism classes finally paid off...LOL!